Neanderthals are arguably the most well known hominin species (other than our own) that have ever existed. Thanks to their European inhabitance and widespread burial practices, paleoanthropologists have tons of Neanderthal individuals to study and make sense of. Interestingly, in addition to being the most well known, Neanderthals were also the first non human hominin species to be named based on fossils. The man who did the naming, however, has been largely forgotten by history. That is until now. 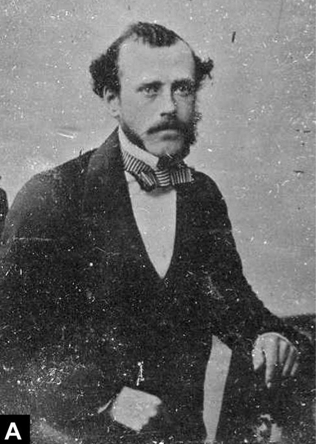 William King (1809-1886) was a Professor of Geology and Mineralogy at Queen’s College in Galway, Ireland, and he studied rocks, fossils, and more. Today, June 24th, is the 129th anniversary of his passing, so I am taking today to celebrate his interesting career and honor his important scientific achievement of naming the species Homo neanderthalensis by telling a bit of his story. This story would not be possible to tell without the recent publication by John Murray, Heinz Peter Nasheuer, and others on King and his role in the history of paleoanthropology. Murray and Nasheuer’s paper “The Contribution of William King to the Early Development of Palaeoanthropology” adds to the extremely sparse (but growing) historical literature on this interesting scientist. In order to understand King’s important role in the history of paleoanthropology, let’s step back and look at the first major hominin fossil that was ever found: the Feldhofer fossil discovered in 1856. Knowledge of the the strange Feldhofer fossil found in the Neander valley made its way to Britain in the early 1860’s. Geologist Charles Lyell visited the cave where the fossil had been discovered in 1860, bringing back with him a cast of the cranium to study. (I wrote about Lyell’s involvement with this fossil here). 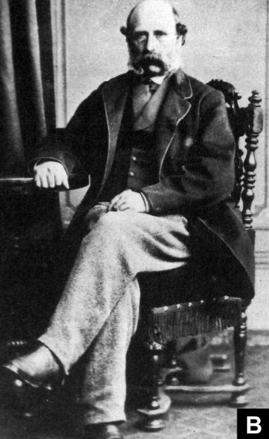 Lyell handed the cast over to his buddy, anatomist Thomas Henry Huxley, who published on the cranium in his infamous 1863 text Man’s Place in Nature. Huxley argued that although the cranium looked kind of weird, with its big brow ridges and elongated shape, it likely fit within the normal range of variation of human skulls. 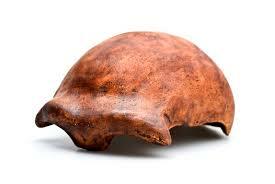 Thus, for Huxley the cranium was simply that of a human, though he considered it a primitive, “lower” form of human. Though many naturalists agreed with Huxley, William King thought otherwise. For King, the idea of this thing being considered human was just plain crazy. 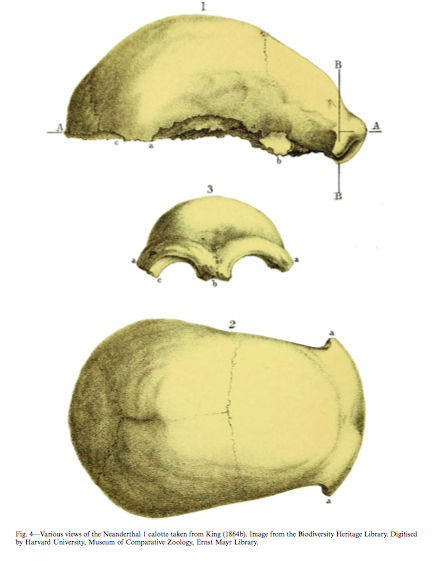 In 1863 and 1864 King argued that this cranium looked more like a chimpanzee than a human, and therefore it should be placed in a new species, Homo neanderthalensis. This is significant because this was the first time that a species of hominin other than Homo sapeins was named based on fossils. Let that sink in for a second. This is the first time a scientist ever looked at a fossil and thought to himself, this looks vaguely human but also very different–therefore it should be another species. A huge moment in the history of the study of human evolution. And, of course it’s worth mentioning that the name still sticks today. It’s also worth noting that King made interesting pronouncements on the fossil’s intelligence in his claims that it could not be human, stating that “the thoughts and desires which once dwelt within [the cranium] never soared beyond those of a brute.” A characterization of the stupid, brutish Neanderthal that we still have not shaken today. I find King’s story interesting for a number of reasons. One is that, when King constructed his argument, he had never actually seen the original fossil. King was working with a cast and some illustrations that had been provided by other naturalists. Another interesting aspect of this story is the fact that this seems to be the only time King ventured into the conversation of human origins and hominin fossils. At a time where naturalists generally didn’t specialize in any one discipline but instead studied a broader picture of nature, this isn’t terribly odd. However, I would still like to know what motivated King, a professor of geology, to become involved in the discussion of the Feldhofer fossil. Many pieces of King’s story still remain fuzzy. We don’t yet know how King got a hold of a cast of the Feldhofer fossil, what made him interested in this work, and so on. We also don’t know the entire story of how King’s pronouncement of the new species was received (though the new paper has begun to shed some light on it). But we’re working on filling in the gaps, and I hope to visit King’s archives in the next year or so as I continue my dissertation research! Photos of King (younger above, older below) courtesy of the Murray, Nasheuer, et al. publication. King, William. “The Reputed Fossil Man of the Neanderthal.” Quarterly Journal of Science, (1864): 88–97. King, William. “On the Neanderthal Skull, or Reasons for Believing it to Belong to the Clydian Period and to a Species Different from that Represented by Man.” British Association for the Advancement of Science, Notices and Abstracts for 1863 (1864): 81–2. Why Homo neanderthalensis is the Coolest Species Name, Ever!